Her power: Storm can control the weather, fly, and shoot lightning from her hands. Her story: It’s never explained how Storm came to join the X-Men in the X-Men Universe’s original timeline, but she’s one of the main members of the team in X-Men. Her ability to control the weather puts her in the field quite often, bringing in Rogue and Wolverine at the beginning of the movie and taking out members of Magneto’s Brotherhood throughout. She teams up with Jean Grey to track down the mutant assassin Nightcrawler in X2, and the quick personal relationships she forms with Nightcrawler and the late Senator Robert Kelly in these first two movies show the immense depth of Storm’s compassion. That compassion, combined with her intense mutant pride, makes Storm the perfect person to take over for Professor X when he’s killed in X-Men: The Last Stand, but she won’t be in the headmistress role for long. 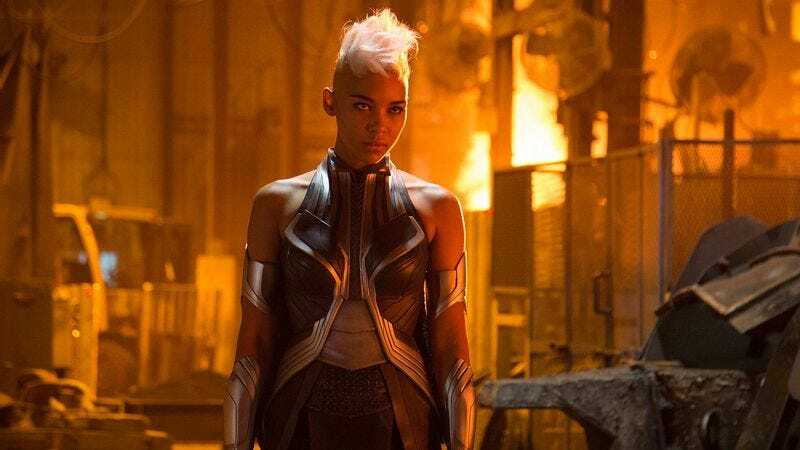 Charles is back in X-Men: Days Of Future Past, and Storm is one of the last X-Men left standing in a future where mutants are hunted, imprisoned, and killed. The timeline change at the end of Days Of Future Past gives Storm a new origin in the XMU, and the young pickpocket Ororo becomes one of Apocalypse’s horsemen in X-Men: Apocalypse. She’s initially impressed by his power when he comes to her rescue on the streets of Cairo, but she turns on him once she realizes that he’s an evil maniac. Storm helps the X-Men take down the villain, earning herself a spot on the team when she decides to enroll at Xavier’s School For Gifted Youngsters. Currently, Storm is: Chilling at Xavier’s School, trying not to remember how she almost helped that creepy purple guy destroy the world. Where will we see her next? There are no confirmed future appearances for Storm, but expect to see her in the next X-sequel with a new white wig for the ’90s.